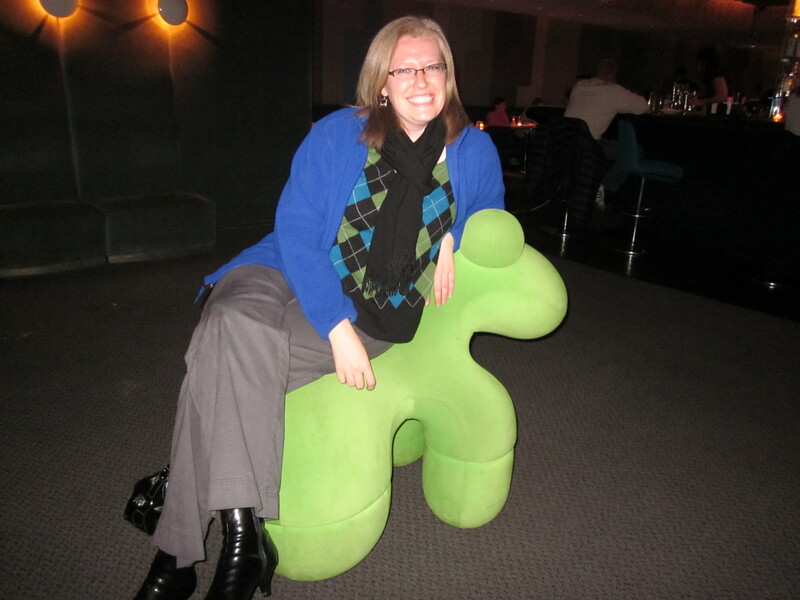 Recently, I spent a week in Philadelphia for work and for play. When you spend a week out of town, living in a hotel room, you eat out pretty much every meal. That’s a lot of eatin’ out, folks. The good news is that Philadelphia makes it verrry easy for you to have good eats all week. Additional good news is that I’m here to tell you all about the good eating I did all week long. Believe you me, I did not have any idea that Philadelphia had such good food. There was so much good food that to tell you all about it will take two blog entries. I promise you, it’s worth the reading! The food in Philly was pretty much an unknown for me so there were pleasant surprises all week long…and then there was scrapple. But I’m getting ahead of myself. The first night in Philadelphia, my girlfriend and I were trying to decide where to go, and every restaurant website we pulled up had music playing. I said to her, “What is it with restaurants in Philadelphia that they have to have music on the websites? ?” What I didn’t know at the time is that all the restaurants we looked at were owned by this fellow named Stephen Starr. Turns out he’s a big deal restaurateur in Philadelphia who apparently believes in music on his websites. You can check out his overview website here: http://www.starr-restaurant.com/ to see his many endeavors. I ended up visiting three of his restaurants while we were there, and they were all muy delicioso! 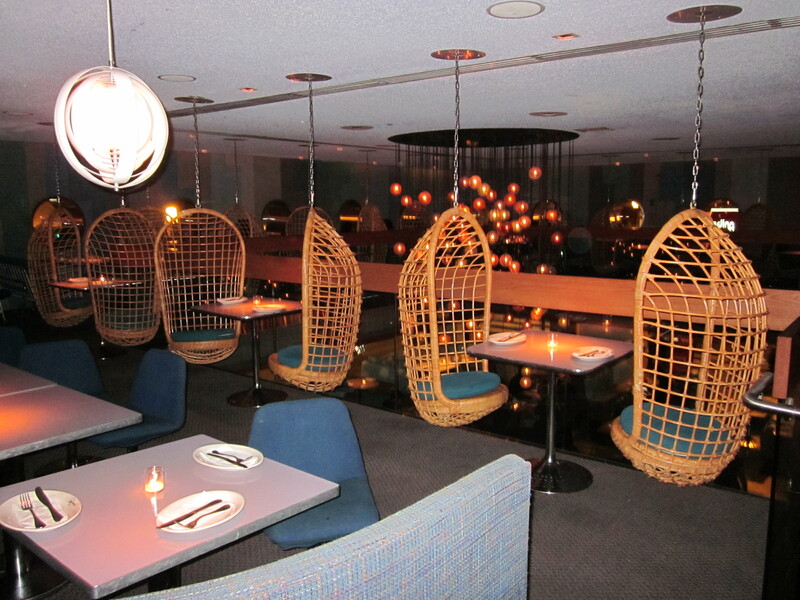 Mr. Starr also knows what he’s doing in terms of ambiance and decor – all his restaurants were very visually engaging. El Vez was the first Starr restaurant I went to, full of skepticism for eating Mexican food north of Dallas. Bless their hearts, people who live up north (or even just outside of Texas) always say, “I know this really great Mexican restaurant. You’ll love it!” *cricket, cricket* It’s just not the same, and we both know it. Every now and again, there is a surprise gem, but on the whole, this Texas girl judges Mexican food outside state lines, at least a little bit. Now the specialty of El Vez is their guacamole. They have six or so varieties from which you can choose. I did order one, and I judged it to be quite delicious. It was the Cesar Chavez: tomato, basil, onion, Oaxaca cheese, with a pasilla-basalmic reduction on top. All for the reasonable price of FIFTEEN DOLLARS!!!!! People. It’s guacamole, not goldamole. El Vez surely does think their guacamole is quite special. I had a hard time stomaching the $15 price tag for guacamole, but it really was oh-so-tasty. It was a fairly large molcajete of guacamole, to their credit, and we ate it all. 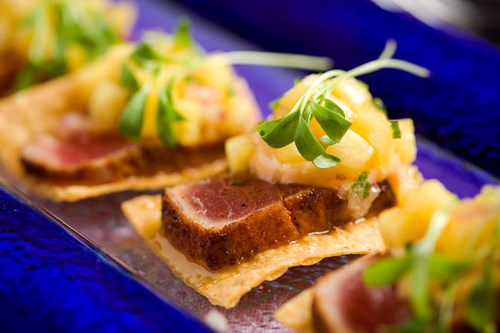 I also had the adobo tuna tostadas to round out my meal. They came from the appetizer portion of the menu, but it was just the right size to go with the mountain of goldamole I was consuming. They were light and quite delicious. I was quite glad I wasn’t obligated to share them. Alas, I didn’t think to take any pictures, but here are some I found online of the goldamole and the tostadas. Judge’s ruling is that the goldamole is worth it at least once. Heck, if I’m back there again, it’s likely I’ll splurge for a different type. In the meantime, I may start experimenting with my own guacamole. The Continental Mid-Town was my second Starr restaurant, and I actually went to this one twice. It is that good. I did only have dessert there both times. Drool. So Good. One of my favorite food genres is tapas. I love small plates of food. This place has dessert tapas! How great is that?!?! The second time I went, my girlfriend and I ordered several of them to share so that we didn’t have to pick just one for ourselves. 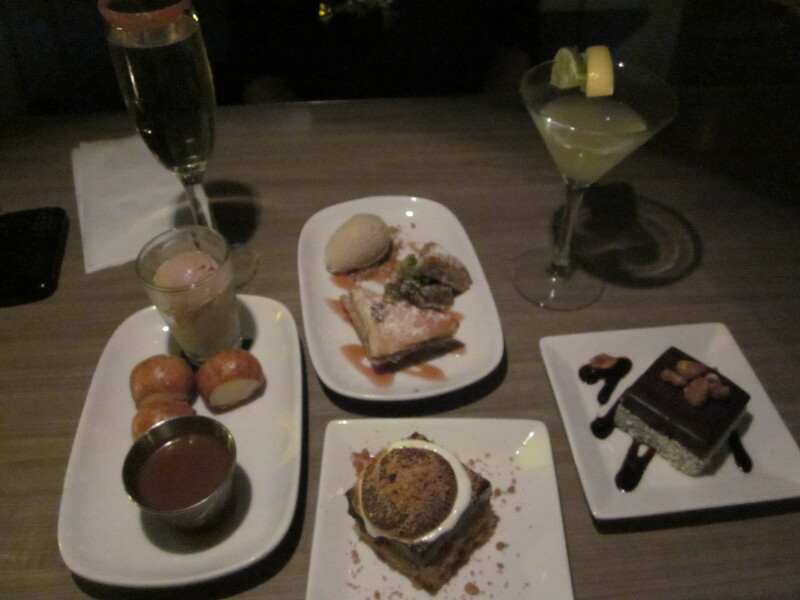 All four desserts together were impressive. 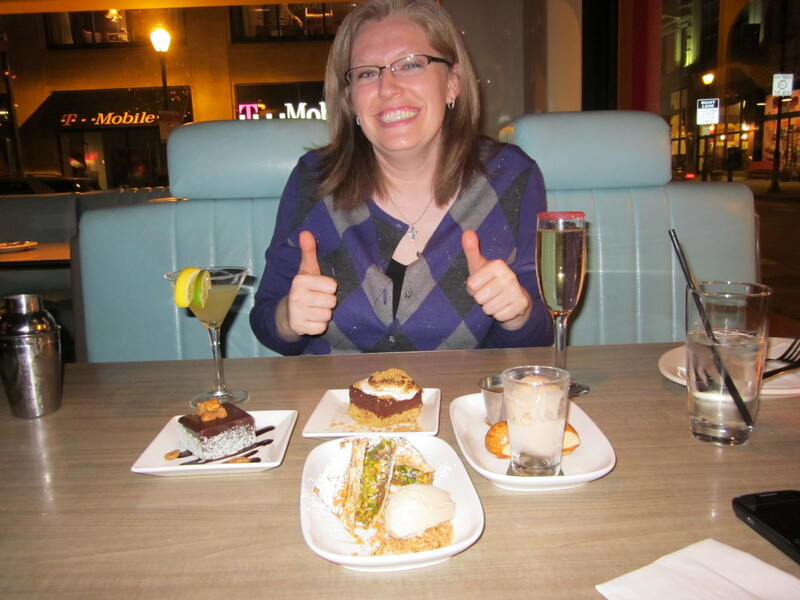 The first time I went, my other girlfriend and I did solo desserts. Either way is a delightful experience. 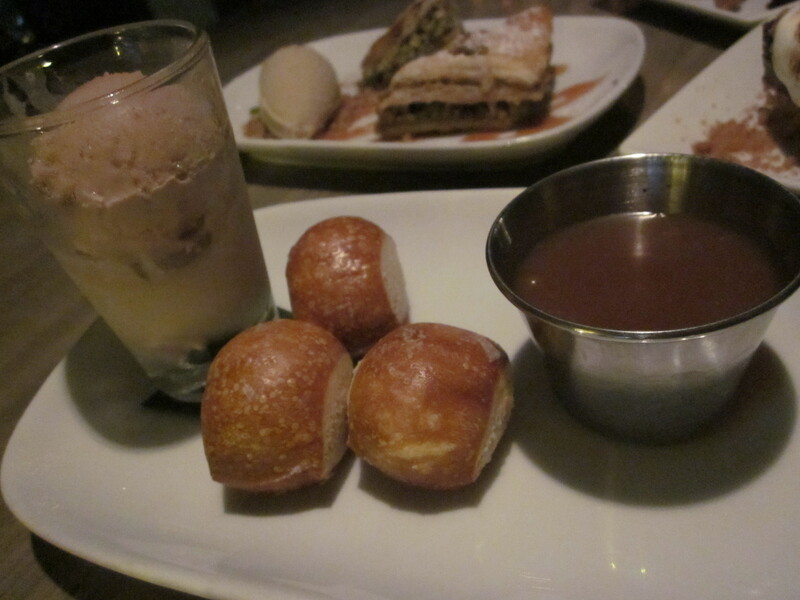 The desserts really are single-serving-sized so you can eat the whole thing and not feel like you over-indulged. 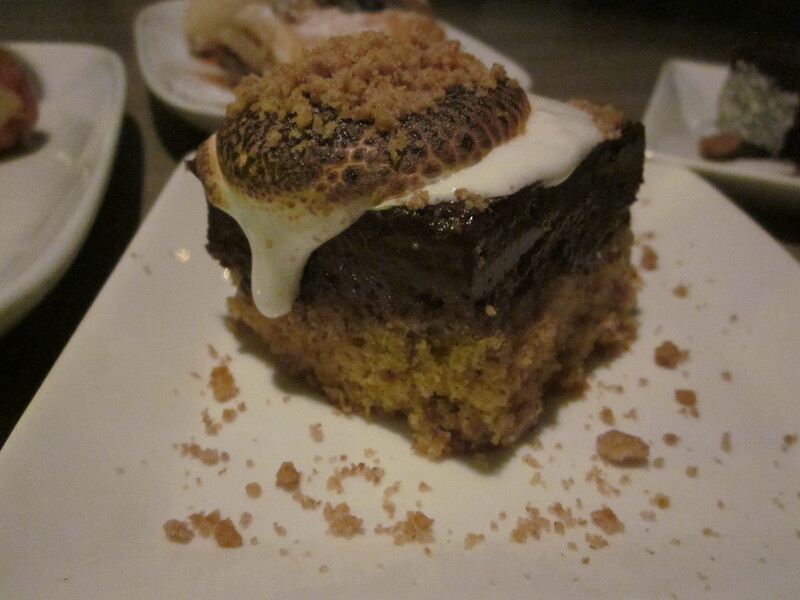 I think my favorite of the four I’ve sampled is the s’more. The bottom layer is a graham cracker cake that is way more delicious than you can even imagine it to be. I was picturing a graham cracker-esque item. No siree. It’s a soft cake that tastes like graham and cinnamon. Next is a chocolate layer covered in a warm, melty, toasty marshmallow. Seriously, they torch the marshmallow before it comes out to you. Hello, attention to detail! I also really enjoyed the milk chocolate Guinness and Earl Grey ice creams. This is a big deal for both as I don’t particularly care for the original beverages in either case. But the ice creams were surprisingly tasty. Homemade pretzel balls with caramel sauce were also a hit for me. 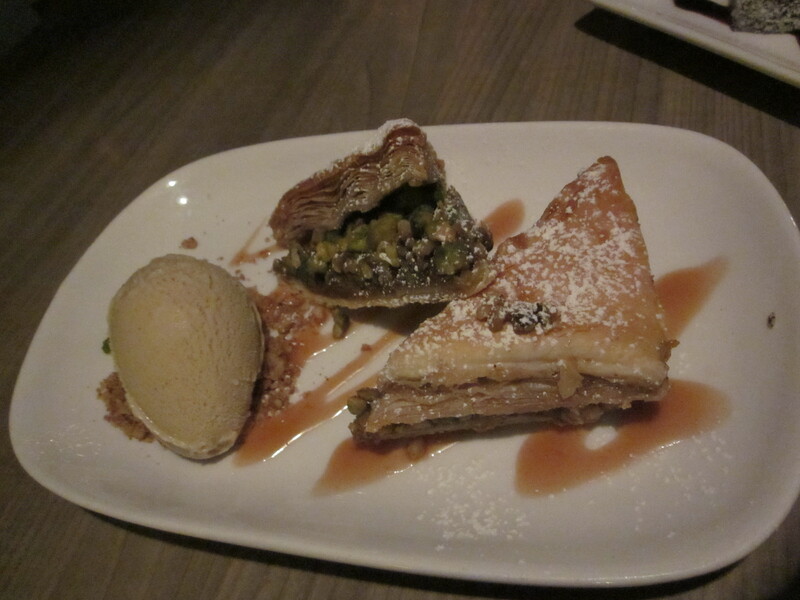 The baklava was tasty, but I always find it tricky to eat. 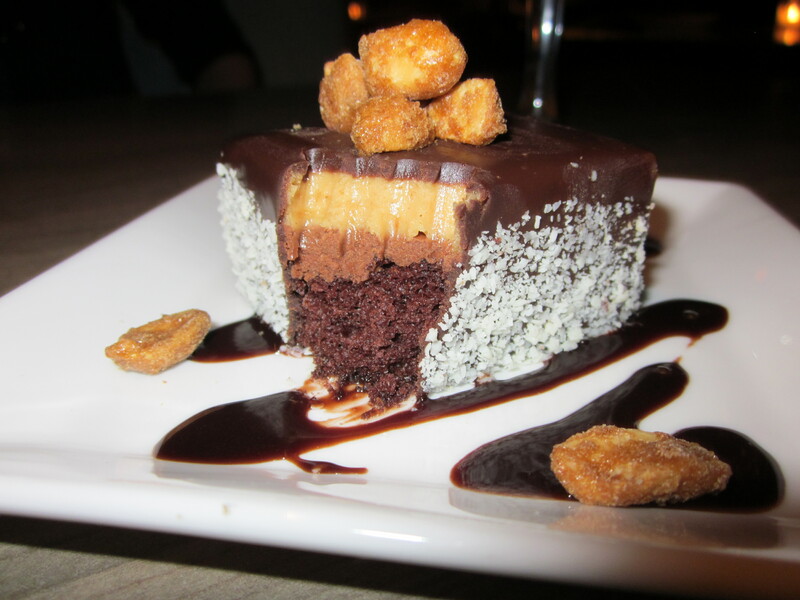 The peanut butter cup was like an expanded Reese’s peanut butter cup so that’s pretty much deliciousness on a plate. It’s all soft peanut-butter-chocolaty goodness. That’s all that needs to be said about that, right? We sure did rock it! 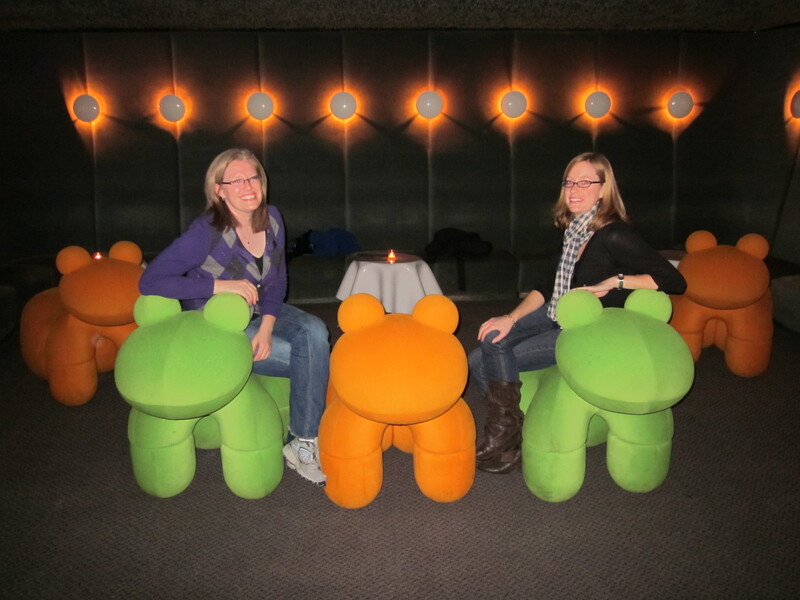 There are also crazy "chairs" upstairs. My third Starr restaurant experience was Jones. It didn’t have the fancy chairs or crazy stuffed animals that Continental has, but the food was still quite delicious. We were there on St. Patrick’s Day, so we had some apple martinis with caramel sauce on the rim. I’d never had an apple martini before, but this was quite the marvelous green beverage. The caramel sauce on the rim was a nice touch that made it taste pretty much like a caramel apple. 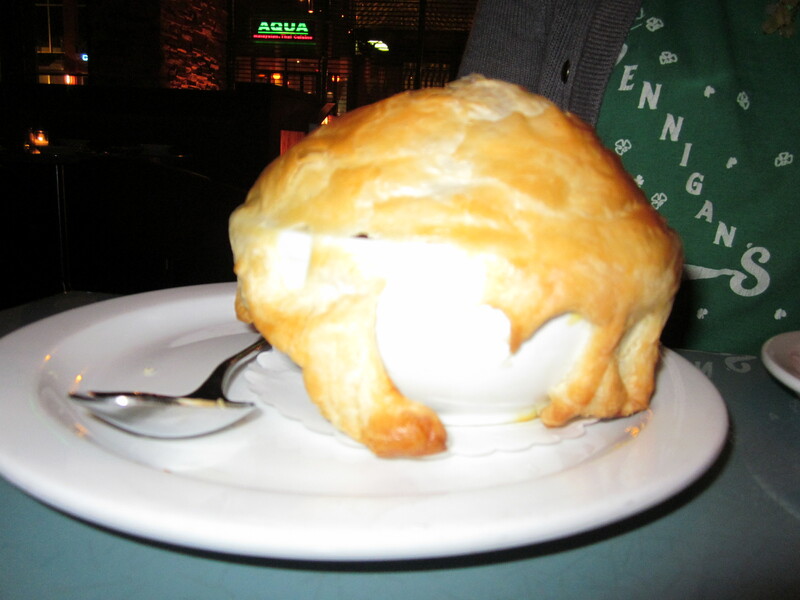 Stacey had the most ginormous chicken pot pie I’ve ever seen in my life, and I had the ALT: avocado, lettuce, tomato, and mozzarella on multi-grain toast with lemon aioli. YUM! It was delicious. It was so very tall! 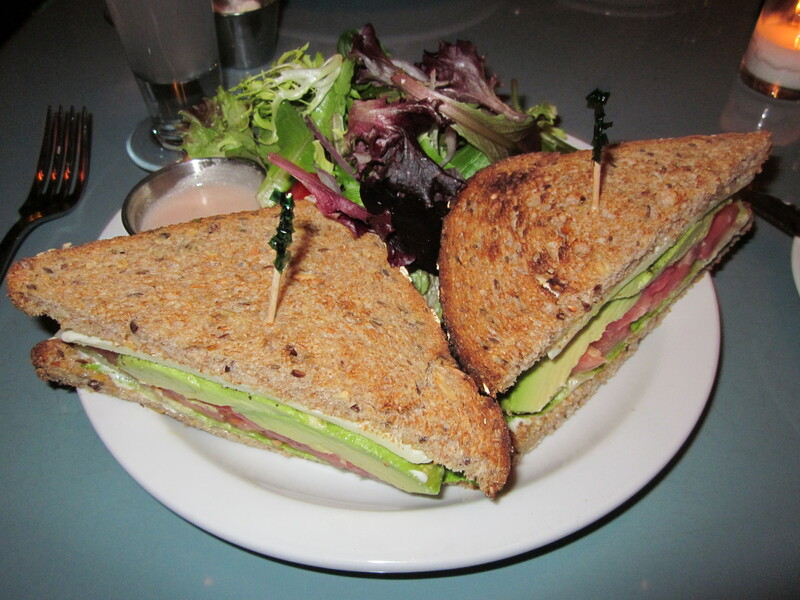 I ate the first half of the sandwich and then took the guts out and mixed them with my side salad greens for an equally delicious “second course.” Go, me and my creative thinking! It was fresh and totally satisfying after a week of a lot of less-than-healthy foods. 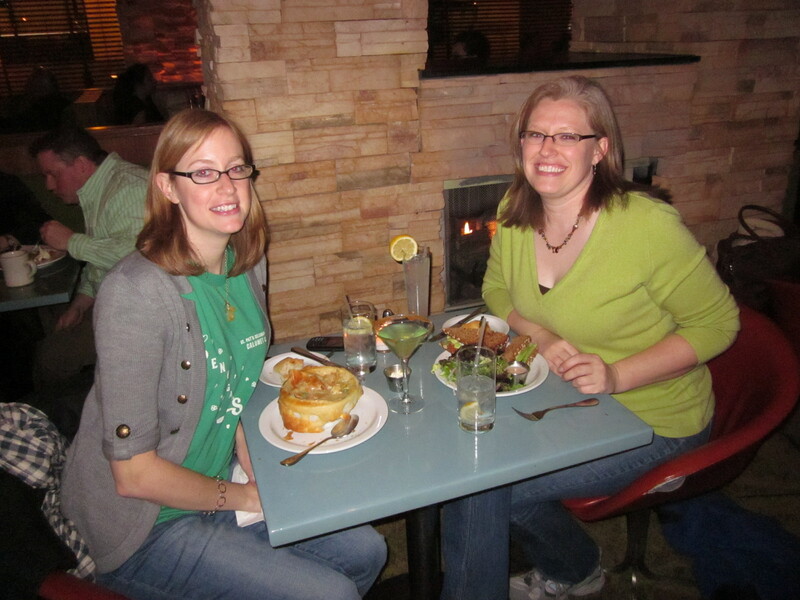 Stacey gave her pot pie two thumbs up as well. We were seated next to a fireplace which totally provided delightful ambiance while we ate and enjoyed our after-dinner coffee cocktail with Bailey’s. Sheer deliciousness. Stephen Starr takes his food and his ambiance verrry seriously, y’all. The least you can do is go see what he’s all about. You won’t be disappointed. Delicious food, drinks, and ambience!